William Morrow Paperbacks, 9780060731335, 352pp. 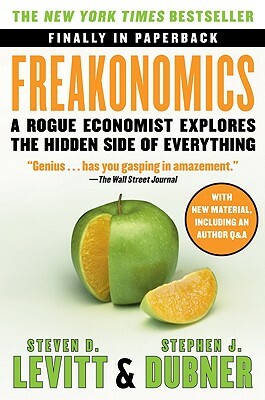 Steven D. Levitt and Stephen J. Dubner offer the long-awaited paperback edition of Freakonomics, the runaway bestseller, including six Freakonomics columns from the New York Times Magazine and a Q & A with the authors. Steven D. Levitt, a professor of economics at the University of Chicago, was awarded the John Bates Clark Medal, given to the most influential American economist under forty. He is also a founder of The Greatest Good, which applies Freakonomics-style thinking to business and philanthropy. Stephen J. Dubner, an award-winning journalist and radio and TV personality, has worked for the New York Times and published three non-Freakonomics books. He is the host of Freakonomics Radio and Tell Me Something I Don't Know. Stephen J. Dubner is an award-winning author, journalist, and radio and TV personality. He quit his first career—as an almost rock star—to become a writer. He has since taught English at Columbia, worked for The New York Times, and published three non-Freakonomics books.